Hello friends and Pleased Friday!! 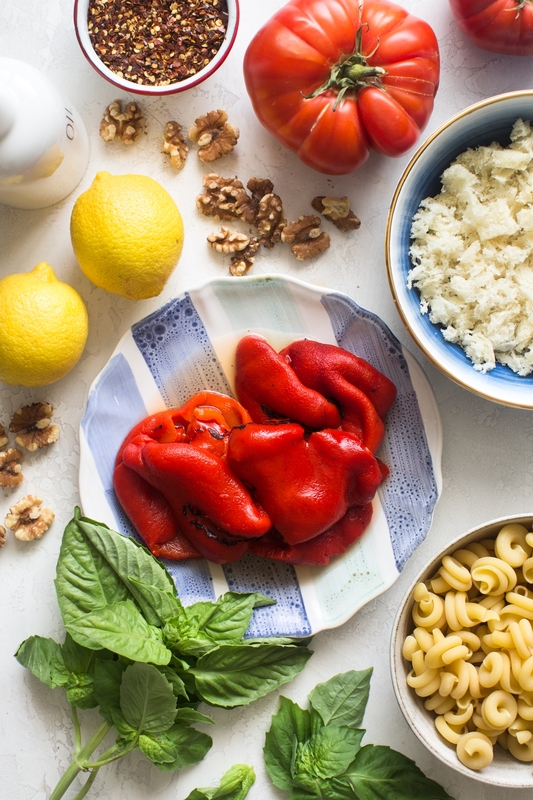 Littered with torn basil leaves plucked from my backyard garden, today’s pasta salad recipe is infused with the flavors of a Spanish romesco sauce. Romesco is one of my favorite sauces to make during the summer months, because the main ingredient is red pepper, a vibrant veg that’s in season mid summer through early fall. You can certainly get bell peppers in all colors throughout the year, but they will taste the best when in season! Romesco pairs perfectly with beef, chicken, fish and veggies, but in this recipe, it takes center stage as a dressing for pasta salad. To start, blitz up some roasted red peppers with toasted walnuts, garlic, lemon and red chile flakes. Extra virgin olive oil is then streamed in to form a silky sauce. This vibrant red sauce is then tossed with warm pasta, chopped tomatoes and grated Parmesan cheese. The salad is finished with more toasted walnuts, torn basil leaves and golden breadcrumbs infused with lemon zest. The romesco-esque sauce is bold with the flavors of red pepper and garlic. 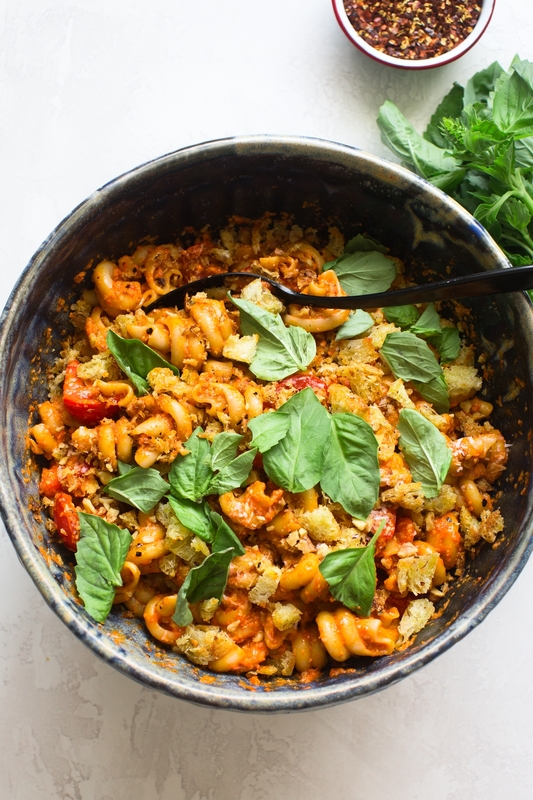 With some bites you’ll get crunch from the breadcrumbs and walnuts while others pack an herbaceous punch from the torn basil. This salad is perfect as a light summer dinner, but you can also serve it as a side at a backyard barbecue or an afternoon picnic. Continue reading for the recipe. At this point, the peppers are ready for this recipe! You can also char the peppers over a grill or over a high flame on your stovetop, but I just find the broiler method to be the simplest. When I first made this recipe, I devoured it for dinner with a small side salad. Later that week, I loved leftovers beside a simple grilled steak. I’ve also brought this salad to a backyard barbecue and it holds up really well at room temperature. There’s no dairy here, so you don’t have to worry about it sitting out for too long. The pasta that I used here is called trottole (Italian for spinning tops), and its curved shape is perfect for trapping all of that tasty romesco sauce. 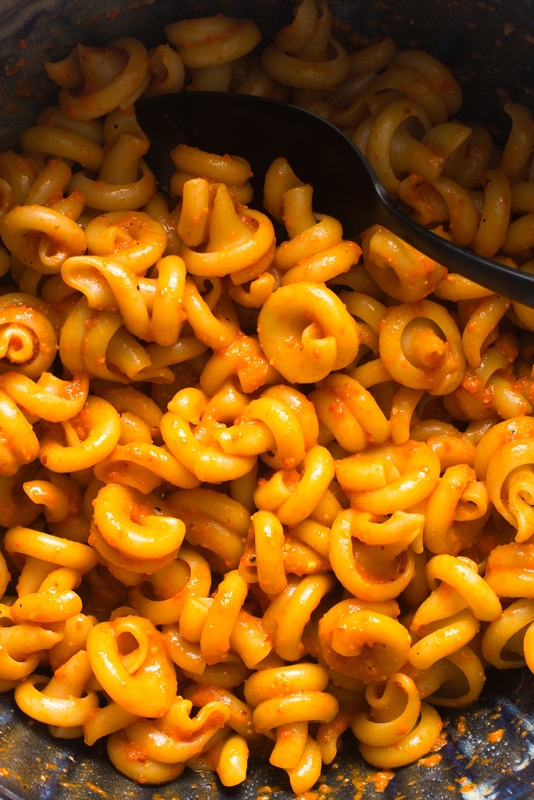 If you can’t find trottole, then you can certainly use any curvy pasta (shells, fusilli, rotini, cavatappi). You toss this salad with part of the sauce while the pasta is still piping hot. This allows the pasta to better absorb the flavors of the sauce. Later, after you end prepping the breadcrumbs, you toss in the rest of the sauce to amp up all of those tasty romesco flavors. Add roasted peppers, 1/4 of the walnuts, garlic, 1/2 teaspoon red pepper flakes, lemon juice and a couple of pinches of salt to a food processor, and blitz until smooth. With the motor running, slowly stream in 1/2 cup olive oil. Season sauce to taste with additional salt – it should be very well seasoned. Set aside. Bring a large pot of salted water to a boil. Cook pasta until al dente according to the package instructions (timing will vary based on the type of pasta you use – about 12 minutes for trottole). Drain and transfer to a large bowl. Toss hot pasta with 1/2 of the romesco sauce and set aside. Warm 2 tablespoons olive oil in a medium, non-stick skillet over medium heat. Add the breadcrumbs, lemon zest, 1/2 teaspoon red pepper flakes and a pinch of salt, and cook, stirring occasionally until golden (5 to 7 minutes). Once the breadcrumbs are ready, toss the pasta with the remaining sauce, then fold in tomatoes, Parmesan and remaining walnuts. Season to taste with salt. End by topping with breadcrumbs and basil. Delight in warm or at room temperature. *Did you know you can easily make breadcrumbs at home? Start by removing the crusts from a nice loaf of white bread (French, Italian, ciabatta, baguette, rustic for example). Cube up the bread, then add to a food processor. Pulse the bread until coarse crumbs form. And that’s it! This is a fantastic way to use up bread that’s gone stale. In this recipe, you can simply wipe out the food processor and use it to make the sauce. 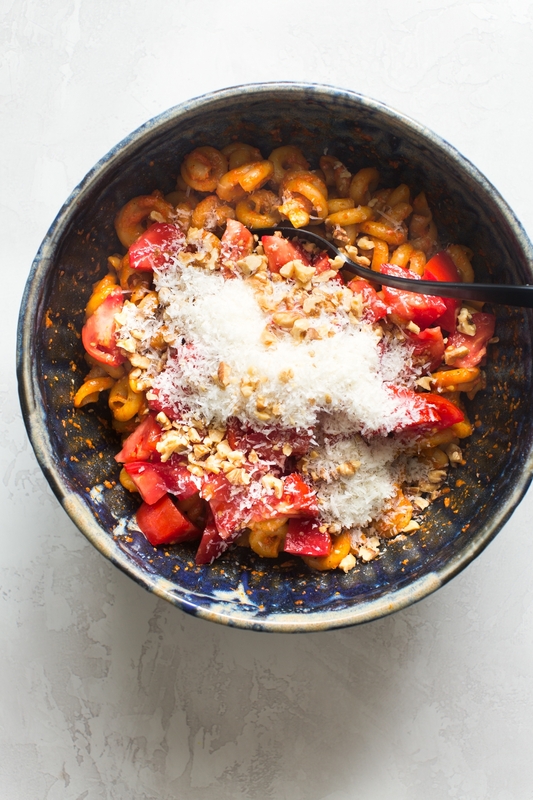 Be the first to comment on "Roasted Red Pepper Pasta Salad with Tomatoes, Basil and Walnuts"